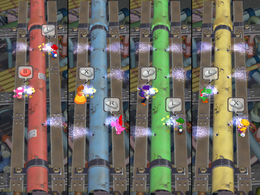 Duct & Cover is an 8-player minigame from Mario Party 7. Its name is a pun on "duck and cover". In this minigame, the players must fix leaks in their team's duct. This is done by repeatedly pressing the button that appears over the players' heads. The team that fixes their duct first wins. Compared to other 8-player minigames in Mario Party 7, it is unique in that all of the controller's buttons are used by either teammate. Rules – "Watch for the button symbols to appear over the pipe, then tap that button repeatedly to fix the leak." Advice – "If you and your partner work on different leaks, the job will go much faster." This page was last edited on April 13, 2019, at 18:37.